These natural and healthy red velvet pancakes don’t use dye but pureed beets instead. And no, you don’t have to cook and peel beets (do you think I’d do that to you?!) This recipe uses CANNED BEETS so it’s super quick, easy and healthy. You may be thinking of ways to show your sweetheart(s) how much you love them this Valentine’s Day. Well, these Healthy Red Velvet Pancakes with Sweet Chocolate Cream Cheese Butter will definitely send that message. If you make one recipe for Valentine’s Day, make it this one! Use a cute heart shaped cookie cutter and you are sure to win them over. And although this recipe is great for Valentine’s Day, I make them all year ’round. These are my kids’ favorite pancakes! I love the Loveless Cafe’s Red Velvet Pancakes so much so that they inspired me to create this recipe and make them healthier! I’m not saying these red velvet pancakes are Weight Watchers friendly or even light; they are clearly an indulgence. But they are a lot healthier than the original! And I’m not a big fan of dye in my food, so I replaced it with beets. The use of beets in red velvet became commonplace when foods were rationed during the second world war. Bakers used boiled beet juices to enhance the color of their cakes and beets were also found in some red velvet cake recipes, where they were used to retain moisture. But beets also add lots of nutrients to a dish; they are an especially good source of folate and vitamin B. Sometimes breakfast is all you have with loves ones on Valentine’s Day. If you’re really lucky, it falls on a weekend or a day off and you get brunch! 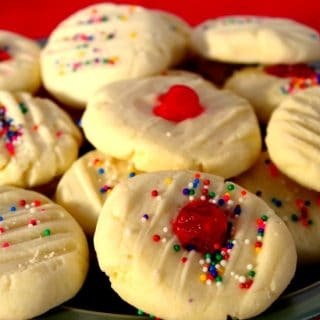 But whether you save your celebration for the weekend or celebrate on the actual Valentine’s Day, these are ideal because they are quick OR you can make them ahead and freeze. I also freeze the sweet cream cheese chocolate butter and it comes out perfect. So, if you are searching for a Valentine’s Day Breakfast that will make your love one(s) swoon, look no further! 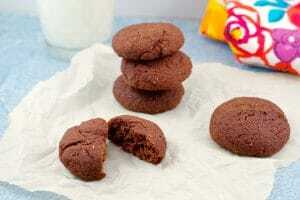 And if you like Red Velvet Recipes, check out my Healthy & Natural Red Velvet Cookies ! 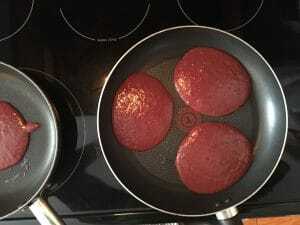 These Natural and Healthy Red Velvet Pancakes with Sweet Chocolate Cream Cheese Butter don't use dye but pureed CANNED beets so it's super quick, easy and healthy. And although they are perfect any time of the year, if you use a heart shaped cookie cutter, they make the perfect Valentine's Day Breakfast or brunch (and can be made ahead and frozen)! Preheat griddle/frying pan (preferrably non-stick teflon) to medium and spray with non- stick cooking spray. * Do not cook these too high heat or they will burn. You have to watch them closely. Stir vinegar into milk and set aside. 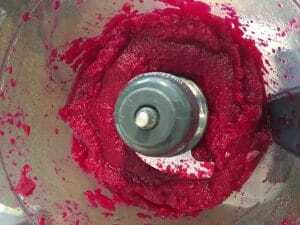 Puree beets in food processor and set aside. Sift all dry ingredients together, except granulated sugar. Mix eggs, milk mixed with vinegar, granulated sugar, vanilla and pureed beets in a separate bowl. Add dry ingredients to wet ingredients in thirds, just until it is combined (will still be a little lumpy). Do not over-mix. When frying pan is hot, add pancake mix to pan – add about ¼ cup mix for each pancake. Flip when the first few bubbles start to break on the surface of the pancake. When the other side is soft and pillowy to the touch, it’s done. Cut into heart shapes, if desired. With an electric mixer, whip butter and cream cheese together for 3-5 minutes until smooth, scraping sides to ensure proper blending. Add vanilla extract and the powdered sugar and cocoa a little at a time until blended. Stack one pancake on a plate and spread on a layer of Chocolate Cream Cheese Butter spread. Repeat with remaining pancakes, dividing cream cheese butter evenly between pancakes. Sprinkle the top with powdered sugar or powdered sugar mixed with cocoa (as in photo). Serve with syrup, if desired. *Note: FREEZING: Both the red velvet pancakes and chocolate sweet cream cheese butter will freeze well for up to 3 months. Cool pancakes, then stack and freeze in a zip lock freezer bag. Chocolate cream cheese butter can be frozen in a freezer friendly plastic container. **Note: You can eat these red velvet pancakes without the sweet chocolate cream cheese butter, but trust me, you don't want to! The sweet chocolate cream cheese butter is the crowning glory. Previous Post: « Easy 3 Ingredient Onion Baked Potatoes in Foil: Potato Pizzazz! These look delicious and interesting reading about the history of the use of beets. I can see it would be a great Valentine treat or anytime for that matter. That’s how I eat them too, Dawn :)! Definitely pinning these to try for Valentine’s! Love the use of beets for coloring. I love that you added a whole can of beets to these pancakes! Gorgeous colour. These would absolutely be perfect for a Valentine’s Day breakfast! Thanks, Leanne 🙂 Yes, we always eat them on Valentine’s Day and my son’s birthday (he requests them)! I am sure my grand kids would love these beautiful red velvet pancake hearts. Using beet juice is such a healthy choice which makes them visually appealing as well. Thanks so much for sharing. Thank you, Denise! Yes, and I agree – love being able to justify eating chocolate for breakfast!